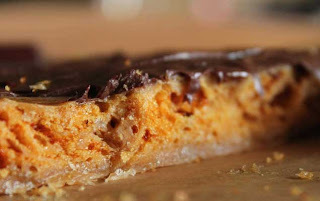 About ten months ago I started an undertaking to recreate the Butterfinger candy bar, I was ultimately going for a cake that tasted like the crunchy, flaky, peanut buttery Butterfinger. This started after a friend tasted a cake I made for Dave, it was an unbelievable, fabulous malted milk ball cake (whopper cake). To this day, anyone who tasted that cake swears it was the most scrumptious thing they've ever had. And it truly tasted like a whopper, down to the gritty middle. So this friend nonchalantly mentioned that her birthday was coming up, and oh, Butterfingers is her favorite candy bar. My sleeves were rolled up before the drool started, and the testing began. I do have a plan for the cake and topping portions, but the key to this is to recreate the actual flaky candy portion. Lets be honest for a second- this type of candy is nearly impossible to create outside of the large, industrial, candy making plant. But that didn't deter me, I made three different batches of candy that day. Fast forward ten months and one new job later... life swallowed me up and spit me out. 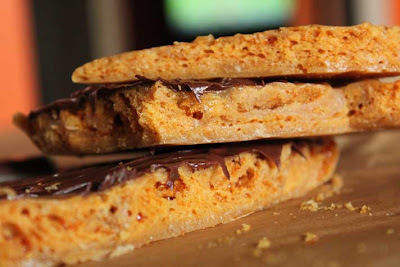 I'm dusting myself off and getting back in the kitchen and back to my many recipe projects that were left unfinished, starting with the Butterfinger. This is not perfect yet, but it's pretty good! Give it go, see what you think. Most of the problem with my earlier batches was that they were too hard. This version gave me those flaky layers that are so crucial to this candy. I'll be refining this recipe slightly more and then making the actual cake (check back for that recipe soon.) In the meantime, nobody better lay finger on my Butterfinger...but if they do, they will be fat and happy! Notes and tips: You must work extremely fast once you add the baking soda, and do not touch the candy after pouring it in the pan or you will loose the layers. Do cover it with chocolate. This only stays for a few days, but before it gets old, it almost seems to soften slightly- making it even more like the actual candy bar. Boil for 10 minutes, do not stir. Pour into the peanut butter, add the baking soda water. Stir and immediately pour onto the parchment paper (this has to happen in lickety spit time!). Do not touch at all or you will loose the layers. Let cool. Cover with melted chocolate. Break apart and eat!